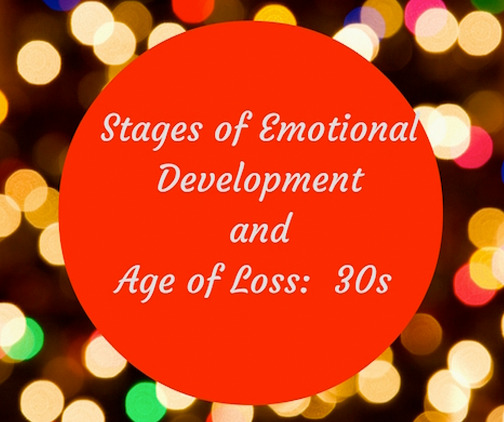 I apologize for the gap in writing about mother loss and stage of emotional development. I am back from a medical leave of absence, so I am planning to continue with these blogs. I left off at the 20’s. This blog is on the 30’s, and then I will write about the 40’s, 50’s, and 60’s, so stay tuned! Now it is time to explore what happens to women who lose their mothers in the 30’s. According to Erickson, this stage is identified by the developmental tasks of Intimacy versus Isolation. We begin to share ourselves more intimately with others. We explore relationships leading toward longer-term commitments with someone other than a family member. Successful completion of this stage can lead to comfortable relationships and a sense of commitment, safety, and care within a relationship. Avoiding intimacy, fearing commitment and relationships can lead to isolation, loneliness, and sometimes depression. Success in this stage will lead to the virtue of love. But when a mother dies, many women have shared with us that loss in the 30’s leaves them feeling guilty, alone, regretful, and scared. Think about what life may be like for a 30’s woman. ~ You have started or are establishing your career. ~ You are making your way in the world. ~ Many times you must relocate from where mother has resided. ~ You may be developing intimate relationships. ~ You may be choosing life-long partners. ~ You may be starting a family or raising children. The 30’s is a time of new roles, new priorities, more time demands, more commitment to your new career, your employer, your significant other, your family and on and on. The 30’s woman is stretched s-o-o-o-o-o thin she is exhausted. The mother-daughter role has changed for the 30’s woman. Her role with mother has transitioned. No longer is mother the most important priority in her life. She is stretched so thin she hardly has time for the mother-daughter relationship. And this is where the guilt and regret comes in. Lots of “what ifs, and second guessing” when a mother dies, the 30’s daughter feels overwhelming guilt and regret that she didn’t make time for mother. Much like the 20’s woman, the 30’s woman still needs mom in her life. Her life is so demanding but she still needs mom to coach her with the how-to’s in life. The 30’s daughter’s loss is huge. I lost my Mom at the age of 88 (I’m 62) & I feel guilty, alone, scared & regretful. All the ‘I wish I had done more’ thoughts even though my husband insists I did it all. The feelings linger though. Thank you for sharing your comments. I have to tell you that I “feel” your emotions. Although your mother loss may have been recent, with these emotions you have to ask yourself “Why?” Why do you have regret and feel guilty? Where does that come from? I don’t know how old you were when you lost your mother. When a woman loses a mother in their 60s, they have may have been their caretaker, almost like taking care of a child. So when they lose a mother, it is like loosing a child. Praying for peace for you. Amazingly accurate. I gave up my whole career to care for my Mom. I lost everything. But my regret is that I didn’t do it sooner. She would get so sad when I would mention moving home to care for her full time. She was my best friend, and I feel like I failed her. Sounds like you have played and maybe are still playing what I call the “what if” and the “if only” game with yourself. If only I would have . . . What if I did . . . things would be different. It is so hard to realize that sometimes regardless what we do or do not do, it is in God’s hands not ours. As far as career, it is never too late to figure out what gives you joy and go do it. It maybe a way to honor your mother’s memory. And it also sounds like your mom wanted you to have a life. I always wanted to have children but after losing my mother at 31 I do not feel that I can do it without her. She would have been such a wonderful and devoted grandmother, it’s too painful to have a child without her around. I thought this feeling would ease but now I am 36 and I still can’t bring myself to do it. Oh Morgan, I am so sorry for your loss. Loss can be paralyzing. The challenge is for you to decide if the loss will keep you paralyzed. It sounds like on top of the horrible grief of losing her, you may have some guilt about whether to have children. Search deep and ask yourself if she was still living would you want to have children? Dig into that. If the answer would be yes, then you must grieve her loss but move forward with your answer. If the answer is no, then you still need to grieve her loss but you will ease the fact that you have chosen not to have children. You say that your mother would be a devoted and loving grandmother and it would be too painful to have a child without her. I know God always puts people in our lives to fill up the spaces where we need to be supported. He would do that for you too. We will always be right here to help you grieve her loss. Keep close to the Motherless Daughters Ministry. Attend classes or online programming that we offer. Come to the Journey Retreat offered in June. The main thing is keep connected with women who have walked in your shoes! Thank you for this post. It is so accurate. I lost my mom in June, six days after giving birth for the first time. I am 32, mom was only 56. The past 6 months have been the hardest of my life, grieving and learning to be a new mom with no sleep and no mom for support. I feel like I have never needed her more, if even just to call her up and ask what she did when I cried, wouldn’t sleep, etc. I always find myself wanting to ask her what to do. Lea, learning to be a mom is a HUGE experience and learning it without a guide or a mentor makes it even harder. I am so sorry that you are on this motherhood journey without a guide. The gift you probably do not realize you have is the internal maternal wisdom you gained from your mother. I did not have a mother when I became a parent either. Many times, I went inside and asked myself what she would do? I always got direction. Try it. You may find you also a huge source of internal maternal wisdom. The other thing that comes to mind is to find groups like MOPS, http://www.mops.org/. These groups have mentoring moms for each small group who may be able to get support. Although it would be easy not to, you must keep working on your grief. As you continue your mother loss grief journey, we are here to support you, listen to you, and care for you. We are here whenever you need us — an email away. You are not alone. Keep us close.